Engagement photos have traditionally been created at the time of your actually engagement. This was the case many years ago when men proposed to their girlfriends in front of family and friends. While this still happens (and I recommend you hire me to capture this beautiful and memorable moment if you aren’t engaged yet! ), more often than not, engagement photo sessions occur weeks and months after the actual proposal took place. Create prints and canvases for home decoration. Create a large print/canvas as a guest sign-in image with (usually place on a table or easel – remember to bring markers!). Create a sign-in album for your guests. While it is possible your date and time have already been selected, if it has not been selected yet, you should consider any time between May through November, with a slight preference toward the May and early June, as well as October and November, to capture better Spring and Fall colors. Generally, my availability is any day of the week, with the exception of prior appointments and weddings. For the “time of day”, I always prefer to do engagement photos during the late afternoon, about 1.5 to 2 hours before sunset. If the location we select for photography has a low-lying horizon, about 1 to 1.5 hours before sunset will do. If sunset will take place behind tall trees or buildings, we should begin 1.5 to 2 hours before sunset. This not only gives us the option to get sunset photos (weather, terrain, and other conditions permitting), but also allows us to exploit the “Golden Hour” when the sun is low on the horizon and casts a warm, fiery, golden color across the faces (as opposed to the harsh mid-day sun that casts strong shadows and makes people squint). Check here to learn your sunset time for your appointment date and session location: SUNSET CALCULATOR. All standard engagement photo sessions are 1 hour in length, with exceptions made due contractual agreement, or made on a case-by-case basis strictly at my discretion. Most of my clients prefer to have their engagement photo session done in the Spring, Summer, or Fall. Some (and this may be you!) like to have that Winter feel – you know, that snowy, cold, sweater and cozy holiday feel. If that is you, I am happy to accommodate you! For more information about how to prepare for a Winter Engagement Photo Session, click this link. If you are in Maryland, your are lucky! Maryland contains various scenic areas to satisfy any taste and “theme” for your engagement photo shoot. Rich with scenic beaches and beach towns, cityscapes, State and local parks, mountainous regions of Western Maryland, historic locations, quaint towns like Annapolis, wineries, and waterfalls. Consider these locations to start your planning, but do so in consideration to the time of the year, driving distance for you and me, costs (if any – please note that entrance fees/parking to parks or other locations in excess of $10 for the photographer, should be covered by the client), open/close times, lighting and weather conditions, and time of the day your shoot may take place. Remember, this is not an exhaustive list, but one that I am mostly familiar with. If you have other ideas, please discuss them with me. Also, all standard engagement photo sessions offer an allowance of a maximum 30 minute drive. *Longer drive times require a travel fee ($50 for any portion of each additional 30 minutes) – please inquire prior to making this arrangement. * Again, it is your responsibility to confirm the open/close times of these facilities as they change often and seasonally. If after arriving we discover that the property is closed and are unable to take photos, a fee to reschedule will be added in this case. Clothes: Bring at least one set of formal clothes, and one set of dress-down informal/casual clothes. Formal would include business or business-casual, or something you and your fiancé would wear to an formal evening out or as a wedding guest. Casual clothes would include jeans and nice tops, but no shorts. You may also bring one other outfit that includes something you do as a hobby, or jerseys of your favorite college or professional sport teams, etc. While you and your fiancé do not have to match/compliment in style or color, sometimes complimenting/matching makes for great photos. Obviously your clothes should be reasonably modest and seasonal as much as is possible (sun dress in the Summer, heavier slightly darker but colorful clothing in the Fall, etc.). Men should generally avoid shorts as much as possible unless the weather is unusually hot. In this case, the shorts should be dress shorts and ironed. Shoes: Shoes are no less important than your clothes! Please be sure to compliment each outfit with the proper shoes, whether dress, casual, high heels, etc. Absolutely NO SNEAKERS under any circumstances! Colors: Please try hard to select clothes that compliment each other, and are PLAIN and LIGHT primary colors (light blue, light pink, white, yellow, red, etc. – think pastels). Plain and light primary colors always come out much more pleasing in photography and help create the desired LIGHT AND AIRY look. Please try to avoid patterns, or at least avoid very busy patterns as these do not turn out well in photos. Consider purchasing something that is modern, tasteful, and different, but not-too-different. The idea is to stand out, but not look strange! Consider using this COLOR WHEEL to help you select colors. Accessories: Please bring large earrings (small ones don’t show up in photos), necklaces, bracelets, watches, etc. We are aiming to make the images like a lot of thought was put into it, not slapped together last-minute! Accessories could also include: boots, cowboy boots and hats, belts, glasses, fashionable hats, etc. Props: Consider bringing your own props to use optionally during the session, as time permits. For example, props may include: Save-the-Date boards (or other items that have “Save the Date” or your specific wedding date written/printed on it), sports items, shawls, jean jackets, goofy and funny items, cigars, unique sunglasses, wine bottles and glasses, blankets and picnic items, decorative boxes, flowers, tables and chair, antique or decorative furniture, etc. You will be responsible for the cost, delivery, permission to use these items at the location. Pets: Pet are permitted and recommended during the session, but it is highly advisable to bring a friend with you to the shoot to help with your pet. Consider brining props and clothing items for your pet for good measure! Just remember that pets may require more attention from you, which will consume time from the intended photography. Personal Style: Please be sure to come trimmed/shaved (legs, facial hair, etc.). We want to create clean professional images. You and your fiancé should have your hair done (professionally if possible). Women should come with make-up that makes them look elegant (not too much, not too little, but this is obviously to taste). 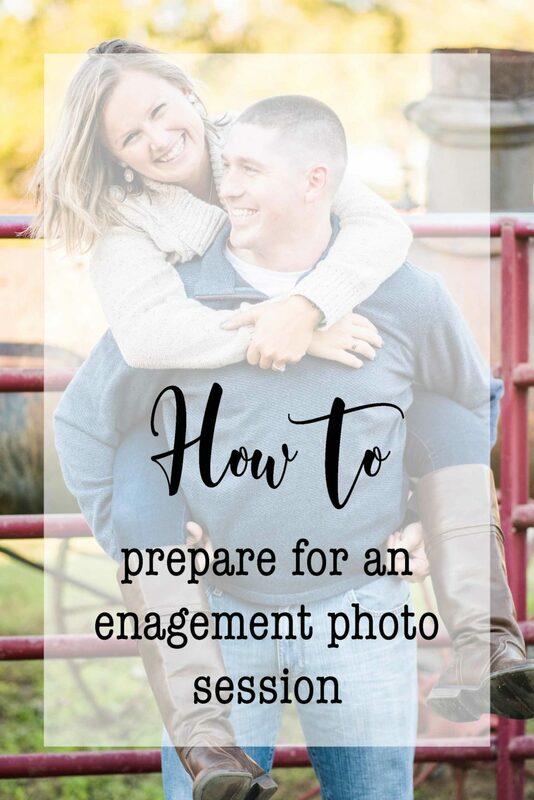 In the end, like all other considerations, we want to put time and effort in making both of you look like you spent time creating these awesome engagement photos! Other: Consider bringing good, safe walking shoes (if the location terrain requires it), snacks, bottled water, and a towel in case it gets hot! Please be on time! Its important we start on time to make the best use of the ambient and natural light. There are many times that I have other commitments or appointments after your session and may not be able to stay after our appointed time. So please plan your travel, timing, traffic considerations, parking, etc. accordingly. I look forward to working with you in planning and executing our ideas to create amazing photos for you! Should you have any questions, please contact me!